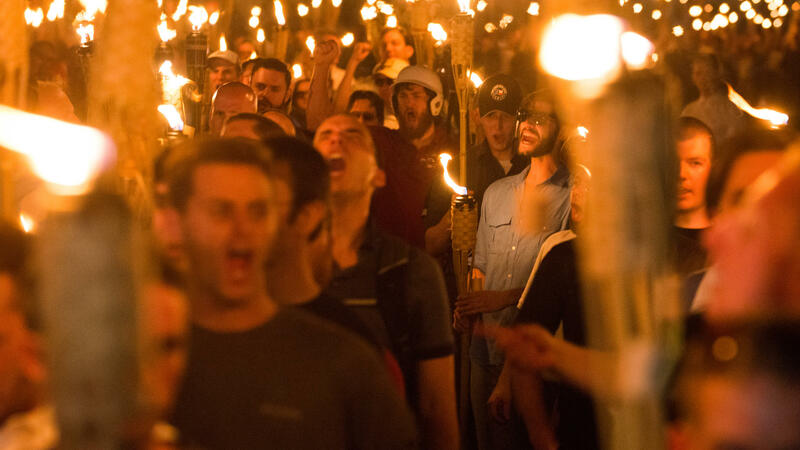 White supremacists march through Charlottesville, Va., the night before the "Unite the Right" rally in August 2017. Federal agents have arrested four men on riot charges connected to the rally. The United States Attorney Office announced today that Benjamin Drake Daley, 25, Thomas Walter Gillen, 34, Michael Paul Miselis, 29, and Cole Evan White, 24, all of California, were all arrested there early this morning by federal agents. Each has been charged with one count of violating the federal riots statute and one count of conspiracy to violate the federal riots statute. Prosecutors say the men flew in from the West Coast "with the intent to encourage, promote, incite, participate in, and commit violent acts in furtherance of a riot." "These four committed particularly violent acts in Charlottesville," U.S. Attorney Thomas Cullen said in a news conference Tuesday. "They committed violent acts in California, at other rallies. Therefore, in our view they were essentially serial rioters." He said the men participated in the torch-lit march on the campus of the University of Virginia on August 11, 2017, which ended in violence. On their way to Emancipation Park for the Unite the Right rally the next morning, "with their hands taped and ready to do street battle," the four "committed multiple acts of violence, including punching, kicking, head-butting and pushing numerous people," Cullen said. The four had carried out violence before, Cullen said, at rallies in Huntington Beach, Berkeley, and San Bernardino, Calif. If convicted, each defendant faces up to 10 years in prison. The criminal complaint alleges that the four are members or associates of "a militant white supremacist organization" called Rise Above Movement (RAM). The affidavit says that Daley is prominent in the organization, The Associated Press reports. According to the Anti-Defamation League, RAM refers to itself as the "premier MMA (mixed martial arts) club of the Alt-Right." "R.A.M. operates like a street-fighting club," ADL says in a web page about the group. "Members actively train to do physical battle with their ideological foes, and have been involved in violent clashes during political rallies and demonstrations. While they consider themselves part of the alt right, R.A.M. 's membership has deep roots in California's racist skinhead movement, and includes individuals who have faced serious criminal charges, including assault, robbery and weapon offenses." ProPublica published an investigation on the group last year. In June, 21-year-old James Fields Jr. of Maumee, Ohio, was charged with federal hate crimes. Prosecutors say he drove a car into a crowd of counter-protesters in Charlottesville the day of the rally, killing 32-year-old Heather Heyer.